ASHWELL, M. & GIBSON, S. 2016. Waist to height ratio as an indicator of 'early health risk': simpler and more predictive than using a 'matrix' based on BMI and waist circumference BMJ Open, 6:e010159.doi:10.1136/bmjopen-2015-010159. GIBSON, S & ASHWELL, M. 2015. Non-overweight 'apples' have higher cardiometabolic risk factors than overweight 'pears': waist-to-height ratio is a better screening tool than BMI for blood levels of cholesterol and glycated haemoglobin. Obesity Facts, 8 (Supplement 1), 139. WISE, J. 2015. Piece of string can assess cardiovascular risk, study finds. BMJ, 350, h2434. ASHWELL, M. 2015. Stevia, nature's zero calorie sustainable sweetener: a new player in the fight against obesity Nutrition Today, 50, 129-134. ASHWELL, M. & GIBSON, S. 2014. A proposal for a primary screening tool: 'Keep your waist circumference to less than half your height'. BMC Med, 12, 207. ASHWELL, M., CHRISTENSEN, P., CHEE, W., LEAN, M. & LEEDS, A. 2014. Formula diets: evidence review. NHD magazine, 98, 14-16. ASHWLL, M., HULSHOF, T., JOHNS, D., BORNET, F., & LASIKIEWICZ, N. 2014. Weight management in the digital age. Symposium report: European Congress on Obesity, Sofia, Bulgaria, May 29th 2014. British Nutrition Foundation Bulletin, 39, 389-393. Ashwell M: Plea for simplicity: use of waist-to-height ratio as a primary screening tool to assess cardiometabolic risk Clinical Obesity 2012:doi:10.1111/j.1758-8111.2012.00037.x. Ashwell M: Tackling the obesity problem - focussing on shape, not weight, and the use of stevia, a natural origin sweetener. Dietetics Today 2011;December. Ashwell M. An examination of the relationship between breakfast, weight and shape. Br J Nurs 2010; 19(18): 1155-9.
de la Hunty A, Ashwell M. Are people who regularly eat breakfast cereals slimmer than those who don’t? A systematic review of the evidence. BNF Nutrition Bulletin 2007; 32: 119-129. McCarthy HD, Ashwell M. A study of central fatness using waist-to-height ratios in UK children and adolescents over two decades supports the simple message--'keep your waist circumference to less than half your height'. Int J Obes (Lond) 2006; 30(6): 988-92.
de la Hunty A, Gibson S, Ashwell M. A review of the effectiveness of aspartame in helping with weight control. BNF Nutrition Bulletin 2006; 31: 115-128. McCarthy HD, Ashwell M. Trends in waist:height ratios in British chlidren aged 11-16 over a two-decade period. Proc Nutr Soc 2003; 62: 46A. Ashwell M. Waist to Height Ratio and the Ashwell ® Shape Chart could predict the health risks of obesity in adults and children in all ethnic groups. Nutrition and Food Science 2005; 35(5): 359-364. Wallace AM, Gibson S, de la Hunty A, Lamberg-Allardt C, Ashwell M: Measurement of 25-hydroxyvitamin D in the clinical laboratory: current procedures, performance characteristics and limitations. Steroids 2010;75:477-88. Lanham-New SA., Buttriss JL., Miles LM., Ashwell M., Berry JL.4, Boucher BJ.5 et al. Proceedings of the Rank Forum on Vitamin D British Journal of Nutrition 2010.
de la Hunty A, Wallace A, Gibson S, Viljakainen H, Lamberg-Allardt C, Ashwell M. UK Food Standards Agency Workshop Consensus Report: the choice of method for measuring 25OHD to estimate vitamin D status for the UK National Diet and Nutrition Survey British Journal of Nutrition 2010;104:612-619. Cavelaars AE, Doets EL, Dhonukshe-Rutten RA, Hermoso M, Fairweather-Tait SJ, Koletzko B et al. Prioritizing micronutrients for the purpose of reviewing their requirements: a protocol developed by EURRECA. Eur J Clin Nutr 2010; 64 Suppl 2: S19-30. Ashwell M, Stone EM, Stolte H, Cashman KD, Macdonald H, Lanham-New S, Webb A, Fraser D: UK Food Standards Agency Workshop Report: an investigation of the relative contributions of diet and sunlight to vitamin D status. British Journal of Nutrition 2010;104:603-611. Lambert JP, Ashwell M. Developing micronutrient reference values: prioritization of tool development by the EURRECA Network of Excellence. Eur J Clin Nutr 2010;64 Suppl 2: S11-8. Ashwell M, Stone E, Mathers J, Barnes S, Compston J, Francis RM et al. Nutrition and bone health projects funded by the UK Food Standards Agency: have they helped to inform public health policy? Br J Nutr 2008; 99(1): 198-205. Ashwell M. A review of the Food Standards Agency's Optimal Nutrition Research Programme (N05). British Nutrition Foundation Nutrition Bulletin 2005; 30(4): 76-84. Gibson S, Ashwell M. Implications of low red meat consumption for iron status of young people in Britain. Nutrition and Food Science 2004; 34(6): 253-259. Singh M, Ashwell M, Sanderson P, Cade J, Moreton J, Fairweather-Tait S et al. Risk of iron overload in carriers of genetic mutations associated with hereditary haemochromatosis: UK Food Standards Agency workshop. Br J Nutr 2006; 96(4): 770-3. Gibson S, Ashwell M. The association between red and processed meat consumption and iron intakes and status among British adults. Public Health Nutr 2003; 6(4): 341-50. Burns L, Ashwell M, Berry J, Bolton-Smith C, Cassidy A, Dunnigan M et al. UK Food Standards Agency Optimal Nutrition Status Workshop: environmental factors that affect bone health throughout life. Br J Nutr 2003; 89(6): 835-40. Cavelaars AE, Doets EL, Dhonukshe-Rutten RA, Hermoso M, Fairweather-Tait SJ, Koletzko B, Gurinovic M, Moreno LA, Cetin I, Matthys C, van't Veer P, Ashwell M, de Groot CP: Prioritizing micronutrients for the purpose of reviewing their requirements: a protocol developed by EURRECA. Eur J Clin Nutr 2010;64 Suppl 2:S19-30. Spichtinger D, Pongratz I, Jonsson J, Braun S, Colmer C, Poms R, Ashwell M, Demeneix B, Skerfving S, Van der poel W, Van der laag P, Kuck M, Warkup C: Key issues in European food science research: a review of the European Food Science Day 2009. Quality Assurance and Safety of Crops & Foods 2010;2:114-119. Koletzko B, Decsi T, Molnar D, de la Hunty A (eds). Early Nutrition Programming and Health Outcomes in Later Life. Springer, 2009. Ashwell M, de la Hunty A, Demmelmair H, Koletzko B. EARNEST - the Early Nutrition Programming Project Standardy Medyczne 2009; 37: 1-73. Ashwell M, de la Hunty A. What is the EARNEST Dissemination and Exploitation Consensus Panel (DECP)? Adv Exp Med Biol 2009; 646: 189-94. Ashwell M, Lambert JP, Alles MS, Branca F, Bucchini L, Brzozowska A et al. How we will produce the evidence-based EURRECA toolkit to support nutrition and food policy. Eur J Nutr 2008; 47 Suppl 1: 2-16. Ashwell M, Claessens M. Best practice in communicating the results of European research to the public. Adv Exp Med Biol 2005; 569: 60-3.
de la Hunty A, Ashwell M, Arens U, Gibson S, Sadler M: Authorised health claims may not help consumers to choose a healthy diet Annals Nutrition Metabolism 2014;64 1-5. Ashwell M, Arens U, Gibson S, de la Hunty A, Sadler M: A challenge to nutrition communicators: some mismatch between food label claims and heart health 'round table' messages. Network Health Dietitians Magazine, 2013;88. Koletzko B, Shamir R, Ashwell M: Quality and safety aspects of infant nutrition. Ann Nutr Metab 2012;60:179-184. Koletzko B, Szajewska H, Ashwell M, Shamir R, Aggett P, Baerlocher K, Noakes P, Braegger C, Calder P, Campoy Folgoso C, Colomb V, Decsi T, Domellof M, Dupont C, Fewtrell M, van Goudoever JB, Michaelsen KF, Mihatsch W, Guarino A, Koletzko S, Rigo J, Turck D, Taminiau J: Documentation of functional and clinical effects of infant nutrition: setting the scene for COMMENT. Ann Nutr Metab 2012;60:222-232. Koletzko B, Ashwell M, Beck B, Bronner A, Mathioudakis B: Characterisation of infant food modifications in the European Union. Ann Nutr Metab 2002;46:231-242. ARENS, U. & ASHWELL, M. 2015. The importance of tender loving care: Elsie Widdowson's research in Germany. NHDMag, July, 11-12. ARENS, U & ASHWELL, M. 2016. Going forward (by looking back to dietetics in the 1930s). NHDMag, April 1-2. ASHWELL, M., FIALKOFF, L, BERDANIER, C. & DWYER, J. 2016. Highlights from Elsie Widdowson's personal diary of her meetings with early US nutrition pioneers in 1936 Nutrition Today, 51, 93-101. FIALKOFF, L., BERDANIER, C., ASHWELL, M & DWYER, J. 2016. 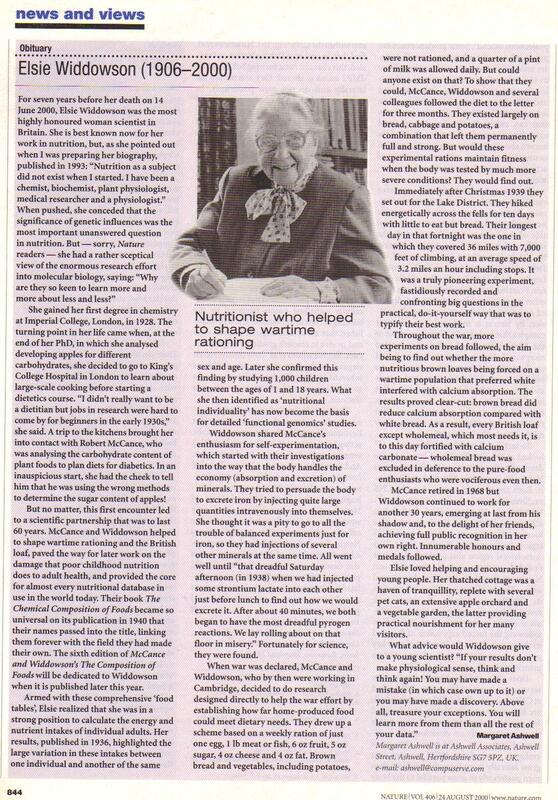 Elsie Widdowson: The Remarkable Life of a Pioneering Nutrition Research Scientist, but an Unsung Dietitian. Nutrition Today, 51, 86-92. Ashwell M: Elsie May Widdowson CH. Biological Memoirs of Fellows of the Royal Society 2002;48:483-506. Ashwell M: Elsie Widdowson (1906-2000). Nature 2000;406:844. Ashwell MA: Robert Alexander McCance (Mac) 1898-1993. BNF Nutrition Bulletin 1993;18:116-119. Ashwell MA (ed): McCance and Widdowson - A Scientific Partnership of 60 Years. London, British Nutrition Foundation, 1993. ISBN 0-907667-07-4. Ashwell M: The life and career of Dr Elsie Widdowson CH CBE FRS 1906-2000. Poster 2002. ASHWELL, M. & VAN DER KAMP, J.-W. 2016. Grain products: short and long term benefits for health and wellbeing. Symposium in the 12th European Nutrition Congress, 2015 Berlin, Germany. Complete Nutrition, 16, 86-89. Gibson S, Ashwell M, van der Kamp J: Cereal Foods and Health: New results and science-based nutrition guidelines. Complete Nutrition 2013;13:26-28. Ashwell M, de la Hunty A: How does breakfast help manage bodyweight? Nutrition Bulletin 2012;37:395-397. Ashwell M: Nutrinsight Number 3: Do we need dietary polyphenols for health? State-of-the-art and perspectives. In Ashwell M (ed): 11th European Nutrition Conference. Madrid, Kraft Foods Europe, 2001. Gibson S, Ashwell M: Dietary patterns among British adults: compatibility with dietary guidelines for salt/sodium, fat, saturated fat and sugars. Public Health Nutr 2011;14:1323-1336. Ashwell M: Nutrinsight Number 2: Whole grain and health: new evidence. In Ashwell M (ed): 2nd World Congress of Public Health Nutrition. Porto, Kraft Foods Europe, 2010. Howlett J, Ashwell M. Glycemic response and health: summary of a workshop. Am J Clin Nutr 2008;87:212S-6S. Ashwell M, Barlow S, Gibson S, Harris C. National diet and nutrition surveys: the British experience. Public Health Nutr 2006;9:523-530. Ashwell M. Workshop on funding opportunities within the Food Standards Agency. Proc Nutr Soc 2004; 63(4): 549-52.